In which cases can I use the Column 1 stirrup - symmetric solution? 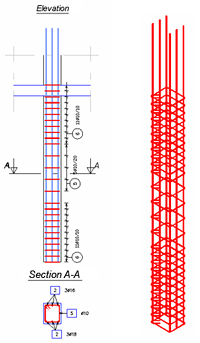 Dynamic reinforcement solutions for columns can be applied to rectangular sections. The Column 1 stirrup-symmetric solution is used for the reinforcement of columns with no variation of diameter. In the properties window 2 elements are available: rectangular frames and vertical bars. First, define the rectangular frame properties (steel grade, diameter, concrete cover, distribution spacing on the two areas, etc. ), and then the vertical bar properties (steel grade, diameter - for this solution the diameter is the same for all vertical bars, concrete covers on bar extremities, hooks on edges, hook lengths, and also bar distribution on sides). Launch the "Apply solution" command on the Advance Reinforcement Solutions toolbar. In the dynamic reinforcement window, 6 types of reinforcing methods are available. The transverse reinforcement: rectangular frames Ø10 PC 52 distributed at 10cm in the potential plastic area ( 1m ) and distributed at 20 cm in the middle area. The concrete cover is set to 2.5 cm for all sides. The vertical reinforcement: 3 Ø16 PC52 per side. The column is anchored to the floor above with 60 Ø. 1. 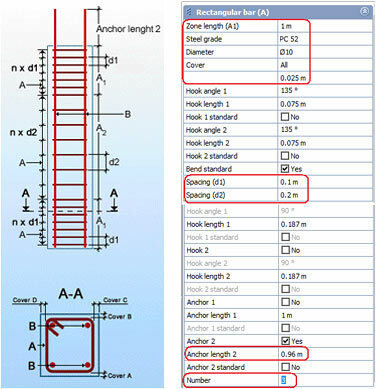 The column R30 x 50 of height Hcolumn = 3.00 m is then created, after which the dynamic solution will be applied. 2. The parameters for Rectangular bar (A) and Straight bar (B) are defined. 3. 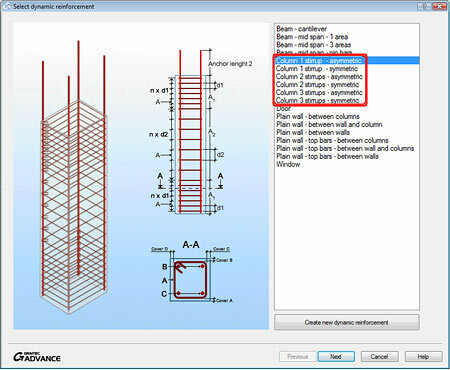 After defining the parameters, a reinforcement drawing is created by selecting the command from the Advance Reinforcement toolbar. The solution may also be applied for wide columns.